Handy, pocket sized MP3/WAVE recorder is ready to capture your power chords. 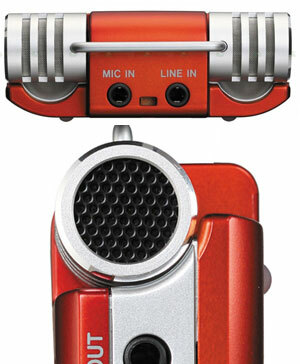 Looking a bit like it's mated with a mini-Cyberman, the GT-R1 is a high quality, portable audio recorder for capturing your 'licks' to MP3/WAVE at 48/44.1 kHz, 24-bits uncompressed. The unit comes with a backlit 128 x 64 graphic LCD and and a 1GB SDHC memory card, leaving you ample time to throw some shapes and lay down your finest hammers ons, pull offs, slides, whammy bar wobblings and note bendings. The SDHC slot means that you can add higher capacity cards letting hit your vibrato and go, go for a bite. The Tascam comes with multiple effects built-in, no less than 55 preset rhythm patterns and packs a cunning 'trainer' function which allows axe-wielders to rock along to their fave tracks at their choice of speed � without changing the pitch. 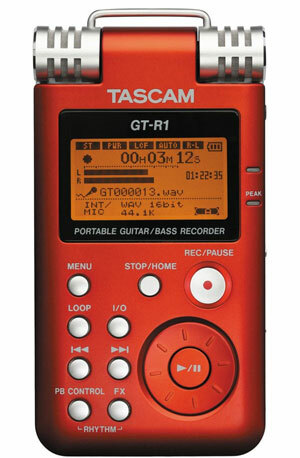 The Tascam comes in a rather pleasing orange/red finish which looks like it could survive being stepped on by drunken drummers or being hit by Derek Smalls' codpiece enhancer. There's no UK release date planned yet, but the Tascam GT-R1 will be out in Japan on August 26th, with a retail price around £160 ($310).